(Photo by Darren Andrew Weimert) Jonathan McVerry and Christie Clancy of Hops & Vines. 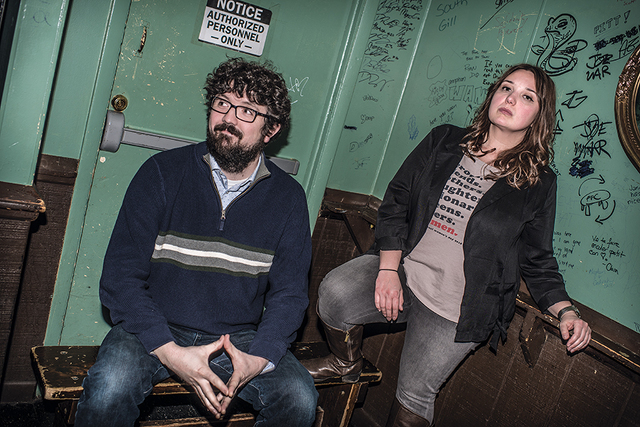 Christie Clancy and Jonathan McVerry share two things in common: their passion for music, and an appreciation of beer and wine, which is how the acoustic duo got their band name, Hops & Vines. McVerry describes himself as more of a beer drinker, while Clancy enjoys a good wine. Hops & Vines started about five years ago with Clancy on vocals and McVerry on guitar during open mic night at The Hopshop Beer Market in State College. The duo has since been performing at breweries and wineries among other venues in central Pennsylvania. Separately, both musicians have been playing for the majority of their lives; they met while McVerry was working for the Centre Daily Times and doing a writeup on one of Clancy’s former bands. Shortly thereafter, they decided to perform acoustic music together. McVerry describes the kind of music they play as eclectic acoustic rock but says they don’t have much of a limit. Hops & Vines also likes to stretch the decades out as much as possible, and usually tries not to veer too much away from the rock genre. “We work really well together because we have similar taste in music but we’re still diverse enough from each other that we can pepper in different kinds of music we wouldn’t normally think about playing,” Clancy says. The duo is primarily a cover band, but writes a few of their own songs, aiming to play at least one or two originals per set. Hops & Vines also has a small collection of live tapings of their sets in addition to one recording in the early days of the band. As Pennsylvania natives, Clancy and McVerry love the opportunity to stay true to their origins and play locally. They feel lucky to be able to work in such a supportive environment and perform at venues with people who are easy to work with. “You’ll have a great experience at places but then if the owners go out of their way to talk to you, spread the word, or treat you nicely, then you feel a part of that local vibe and that culture,” McVerry says. The duo says playing locally allows them to see both new and familiar faces whenever they perform, while giving them a chance to connect with the audience more. McVerry says he is a big fan of small-town Pennsylvania because he enjoys going to different places with different people, yet they all tend to like the same kind of music. Hops & Vines plays every weekend, with monthly shows on Fridays at Happy Valley Vineyard & Winery in State College, monthly shows at the Broken Axe in Lock Haven, and performances every third Saturday at Race Street Brew Works in Clearfield. In addition to the usual brew houses and winery venues, Hops & Vines has been working on yearly benefit shows called Hops & Vines & Friends, with proceeds going to causes like Centre County PAWS. “When we started doing Hops & Vines & Friends we asked local musicians to join us, or people we just knew were really talented musicians,” Clancy says. Since then the duo has picked up a few friends who will play shows with them every once in a while. They hope to begin working on Hops & Vines & Friends Part Three, which will be sometime in the fall. Clancy and McVerry are also looking to add more original songs to the docket and have a few bucket list venues they would love to play, including at Arts Fest. Both members of Hops & Vines work at Penn State during the week, and say the band is a great outlet to do something they are passionate about. As their music career progresses, they hope to continue doing what they’re doing and collaborate more with artists to build up that family. The band members appreciate the simplicity of creating live music to show their audience a good time, without pressure to make it big. To learn more about the duo, visit hopsnvinesband.com.